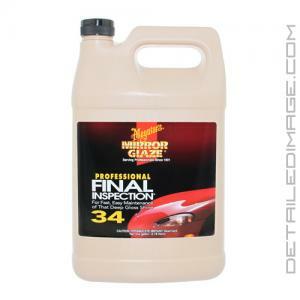 Meguiar's Final Inspection is an excellent quick detailer used to clean exterior surfaces, which is also known as #34. The Final Inspection has special lubricating ingredients that allow you to clean the exterior safely and easily, while creating a more vibrant looking surface. It helps remove dust, dirt, pollen, and finger prints on the surface so your paint, glass, wheels, and headlights can stay clean and look freshly detailed. It encapsulates these contaminants so they can be removed without dry friction, which is far more likely to cause scratches. Just mist it on the exterior and wipe the desired areas with a microfiber towel and light pressure. It also has gloss enhancing agents that make the surface look better and feel slicker. It's perfect to use before a car show or just after a full detail to keep the exterior looking perfect. Don't just look at that layer of dust on your car anymore, remove it safely while adding more shine with the Meguiar's Final Inspection M34. DIRECTIONS: SHAKE WELL. Apply in the SHADE on a COOL SURFACE. (Not for heavily soiled finishes.) Mist product on a small area and quickly spread evenly over the finish with a clean, dry, Meguiar's Ultimate Wipe (M9910). Immediately turn towel to dry surface and lightly wipe to a deep gloss shine!